The inaugural British Championships season, which began in early January, finally came to an end last weekend (Nov 21st & 22nd) as events in Dunstable, Barnstable and Preston brought the lowest rung, Tier 4, to a close. 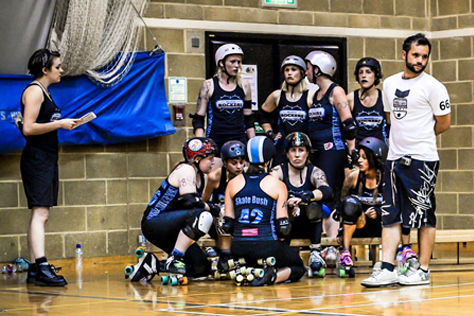 The level Brighton played at this year, Tier 2, actually saw its season end in mid-September with playoffs at the London Rockin’ Rollers home venue, Newham Leisure Centre. There was an air of inevitably about that final day. We’d been saying all year in our fanzine and online previews that the deck was stacked heavily against the Southern division, with those taking part in the Northern bracket generally of a much higher ranking. So it proved as T2 South winners Royal Windsor and runners-up LRR came unstuck against Nottingham’s Hellfire Harlots and Newcastle Roller Girls respectively, both by convincing margins (80 and 154 points). Unless the rules are altered to allow the mighty London Rollergirls to enter their B-team, it seems unlikely that we’ll see a team from Southern England in Champs Tier 1 any time soon, with Northern sides yo-yoing between T2 North and the top flight destined to become an annual tradition. There were quirks elsewhere in the pyramid too, such as Brighton’s friends Croydon winning their T3 division with five straight (mostly big) wins, only to be denied promotion via a playoff with Birmingham Blitz Dames at the latter’s home venue. Such regional discrepancies are something that British Champs may need to address when tweaking the tournament’s format for 2016, but these aren’t a factor in the Rockers’ withdrawal from the competition. Brighton formally confirmed that withdrawal on their Facebook page the day before they hosted August’s Champs triple header. Whilst it’s clearly something the league had been discussing for a while, we at BRATS only became aware of it (like others) via that Facebook announcement, although if we’d paid more attention to Dr Whooligan’s interview replies for our magazine we might have realised earlier! 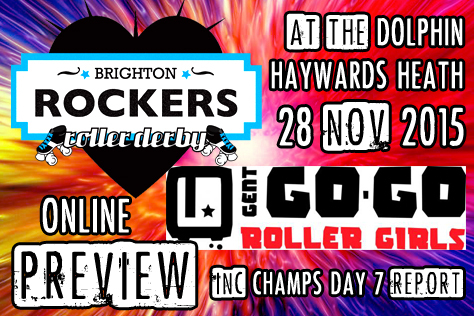 A member of another league suggested to us at the triple header that “hashtag don’t like losing” might have been in a factor in Brighton’s decision, and it’s true the Rockers went into Champs ranked favourites for the second playoff spot, only to place fifth and be relegated. The day gets off to a bad start when a wasp drinks our pint. We take a seat outside the Burrell Arms opposite Haywards Heath station for a pre-derby livener, but we haven’t even placed our first Guinness of the day on the table before a wasp flies straight into the head of it and starts taking big glugs. Being rightly scared of wasps, we step back a few paces. By the time we tentatively creep back up to the glass there’s already over an inch of it gone and the wasp shows no sign of slowing down. We explain this predicament to the landlady, hoping that she will replace our drink in response, but she just calls us wusses and returns to emptying the glass washer. Perhaps this will serve as some sort of metaphor for the day, although we’re buggered if we can work out how. Any sting in the tale of Champs for the Rockers was administered long ago by Bristol and Portsmouth, who both overturned the rankings to defeat the Sussex side. Today’s opponents on this final day of Tier 2 South are Brighton’s ‘sister league’ (and sponsor of their WFTDA Apprenticeship) LRR. The Rockers are fielding a makeshift bench crew of Noise Tank on shouting and Lab Wrath on clipboard, but the strong London walls make it heavy going whoever they send out there. LRR take lead in every one of the first ten jams and are already nearly 50 points ahead. Dr Whooligan puts in a good shift in the star, winning a jam 18-12 despite sitting some of it out in the penalty box, and the Rockers are starting to make inroads into LRR’s lead. 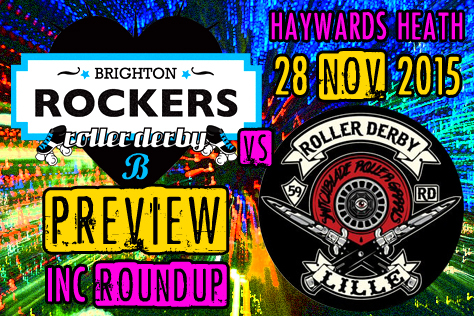 Chaka Carnage throwing some big hits the way of LRR starhead Rammit, but even when Brighton get their jammer out first, the Rockin’ Rollers packs hit the turbo button to minimise any scoring opportunities. A half time score of 122-46 to the visitors demonstrates the gradient of the mountain Brighton must climb in the second period. Despite a spirited fightback, with some strong jamming from Rose Bleed and Gin Atomic amongst others, the rowdy travelling support have a 207-141 victory to celebrate. 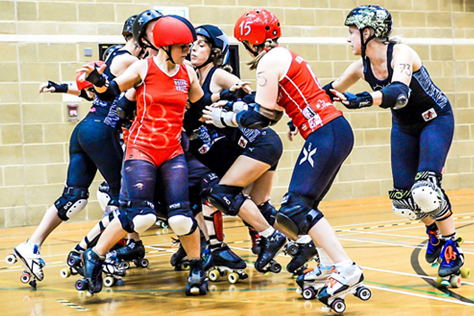 Up next are the table-topping Royal Windsor against surprise package Bristol Roller Derby. (Although given how many tournaments Bristol have been a ‘surprise package’ in, maybe we should stop being so surprised.) The Wild West side’s fans are typically loud – at times the hall is a cacophony of ‘B.R.D.’ chants and bell ringing – whilst Windsor’s are typically sparse, but it’s the latter who will have most to sing about when the final whistle sounds. RWRG’s Culverhouse shakes off the Bristol hits as Trashbag dispenses heavy blows in return. Bristol’s Lil Miss Bloodlust and Windsor’s Vix have identical stats in Champs this season, but the latter is getting the better of their starhead match-ups today. With a half-time tally of 174-104 to the regals, BRD will need to up their game in the second period. This they do as some fantastic jams from Delta Strike help close the gap to under 50 points. Vix takes a 25-5 win over Bloodlust to put Windsor back in control, with the lead jammer status stats currently 9-7 in the Berkshire side’s favour. The final twenty minutes see RWRG stretch that to 19-10 in leads. The reward for BRD’s battling is keeping the differential below triple figures (just) at 328-229. LRR kept Windsor to the exact same 99-point margin in the previous game day, so a battle for league placing between the London and Bristol sides could well be a highlight of next year’s Champs. For now, Windsor and LRR get the chance to be spanked by T2 North in playoffs. The day’s final game sees Portsmouth up against the Seaside Sirens of Southend. To say the latter have had a tough year in Champs is something of an understatement. They’ve lost their previous four games by an average of 258 points and the Wenches are looking to heap on more misery. It doesn’t start well for the Essex side, with an injury to Pegasus in the very first jam (and her ensuing treatment) reducing the already small Sirens squad to just nine players. They’ll end the game with even fewer, numerical disadvantage – through league size, injuries and foul outs – being a dominant feature of their Champs season. It doesn’t help when the opposition has starheads like Rosie Rocketpants, who takes one first half jam 29-0. Force Ten Gail is Southend’s best player here and is responsible for most of the few lead jammer statuses Sirens eke out. Whatever Gail can chalk up points wise, the likes of RIP McMurphy, Nina Nunchucks and Rosie are returning with interest though, and despite a battling performance from the Seasiders, Portsmouth take it 281-109. So that was Champs. It remains to be seen if other leagues join Brighton in withdrawing, but it would be understandable if some of those who topped their divisions – only to miss out on promotion due to a tough playoff draw – might be considering it. Here at BRATS we were very much fans of Champs, largely as it set up most of a year’s worth of fixtures in advance, which we found very handy in terms of planning away travel/hotels and managing fanzine deadlines. It’s fair to say that committing to five or more fixtures so far in advance was less beneficial for the league, though, in terms of managing player availability and so forth. We’ll have to see what the next year brings in terms of games, but things get off to a strong start with this Saturday 28th’s double header in Haywards Heath. The Rockers A-team will face Gent GO-GO Roller Girls from Belgium, whilst the B-team take on Switchblade Roller Grrrls from Lille (France). You can find a separate preview of the B-team game (including a summary of recent Rockerbillies travels) HERE. Saturday’s action kicks off at 2.35pm (doors at 2pm) with the A-team game up first. Tickets are priced £10 adults, £8 students and free for Under 12s. These will be available on the door, but we usually recommend getting them in advance from the link below if possible. Rustle up a crowd of four adults and one of the tickets is free (online only) with internet sales ending at 4pm tomorrow (Friday 27th). The venue is the Dolphin Leisure Centre, which is around six minutes walk from Haywards Heath train station. Trains take just around 15 mins from Brighton and 45 mins from London. Turn left outside the station and follow the roller derby signs stuck to trees and lampposts. The pub opposition the station – the Burrell Arms – now does craft beer and is OK for a pre-game pint, although they might be showing rubbish football (Charlton v Ipswich) on TV. Halfway between the station and leisure centre is a big Sainsbury’s with cash machines etc. There are fizzy pop and snack machines in the Dolphin’s lobby, along with a cafe bar that habitually expects a dozen bottles of Peroni and six miniatures of wine to be enough stock for a sizeable roller derby crowd. The after party will be back in the heart of Brighton, upstairs at The Western (formerly Western Front) right next to Churchill Square. As for the game itself, Brighton and Gent met in Belgium in March 2012, with the Rockers triumphing 169-140. This was only the second open door away game in Brighton’s history and one of Gent’s first home open doors. Much remembered for its raucous after party and the strange system of having to buy lottery tickets to get served at the sports hall bar, the two teams have changed far too much for us to make any prediction based on that past game. Instead we’ll consult our old friends flattrackstats.com, who tell us that Brighton are currently rated the 49th best team in Europe with 610.4 ranking points. Gent GO-GO, the top league in Belgium, place higher at 27th on 652.9. FTS give Gent 77% chance of taking the win, with a predicted score differential of 48:35 working out at something like a 240-175 away win. This game is certainly going to be a test for the Rockers AllStars as they begin a year of European contests, so make sure you’re at the Dolphin to see how it pans out. Don’t forget to pick up your copy of our new look (very orangey) fanzine on the door – this issue includes a voting slip to vote for your Rockers Players of the Year. Cheers!